ABOUT 13 years ago I first learned to run. Before then I would try but would set off all keen and then have to stop and walk for a bit. It was very discouraging. Years of school inter-form running or cross country (AKA running around the school) had hammered into me that I was pretty useless at it (as for most sports) and my memories are of getting really cold, falling in muddy ditches and generally never getting clean or dry before I then had to go straight to band practice! I wanted to enjoy it but couldn’t get a rhythm. I’d get a stitch or couldn’t breathe. I loved dancing, aerobics and training in the gym but running – no. It was my nemesis. So when – with the help of a keen runner, Mike Hall (no relation) who was on my team at the PRS whilst we built them a new IT system (these were the days of Karen, the management consultant) – I completed my first ever 5k Corporate Chase Challenge back in 2001 it was a really big deal. Roll on to 2014 and I somehow sit here with a snoozing six month old next to me and a three and a half year old at preschool. I run my own business and can remember little about coding in java or C (these are probably outdated now) but I do remember I always loved getting the team ‘on board’ and getting results. 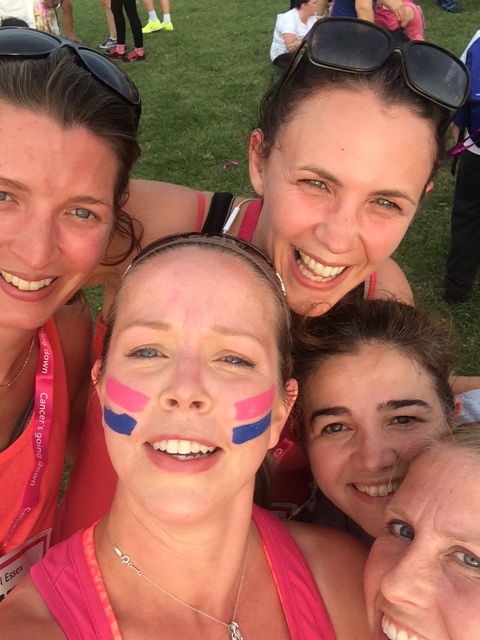 So when on Wednesday, we had our first little Fit School team running in the North Weald Race for Life it might not have seemed like a big deal to many but to every woman who had never run that distance before, or taken part in a ‘race’, or felt like they were a bit rubbish at sports, I knew how it felt. 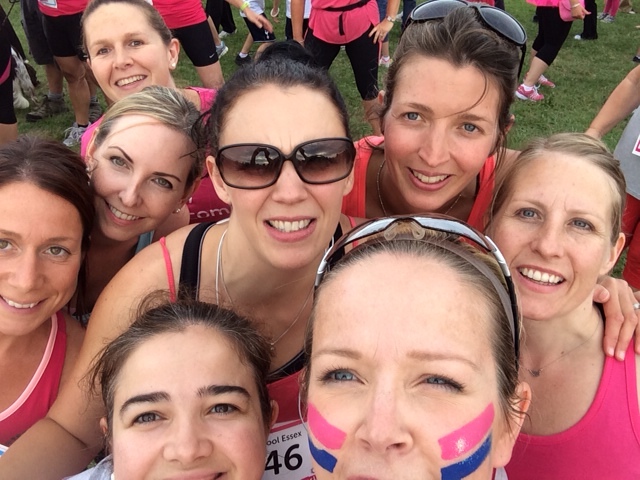 I also knew, that a now very dear friend, who lost her mum to cancer last summer, would be running 10k. Amy is a sunshiny, giving person and I wanted to be there for her too. I’ve run in events since my first 5k but I’ve always felt pretty nervous due to the ‘pressure’ of doing a time. This event was different. I was going to get everyone round because that’s what I love doing. 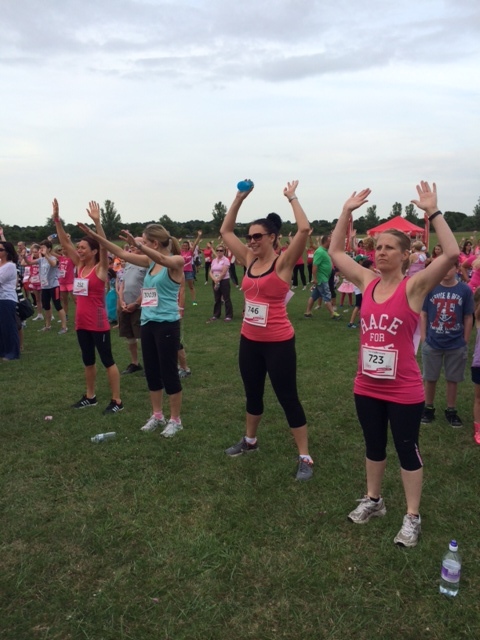 I could never have imagined just how incredible it was to see the perimeter of North Weald Airfield covered in little pink running and walking dots as runners, joggers, plodders and walkers just got out there and did something defiant and amazing. The team all made it round and all felt amazing afterwards. I got laughed at for running in the wrong direction at times but then I wasn’t going to leave anyone out there on the field! It’s very easy to sit back and think, ‘It’s okay for her – she’s thin,’ or, ‘it’s okay for her, she has the time,’ or, ‘I can’t run because …’ but events like this are great for just getting everyone out, off their behinds, and sharing time, effort and hugs. So perhaps you need a little encouragement to do some exercise or you’d like some guidance – or perhaps you’re feeling a bit low, or maybe a lot low. That’s okay. It doesn’t make you stupid or a nuisance. It makes you human. And there are always people like me who get a complete buzz out of being an encourager because I had enough of feeling like I was useless at sports when I was a teenager. Oh and for all my cross country efforts, I’ve since discovered that endurance events are in my genes – so it’s time for me to stop making excuses, learn how to run and just do it! ← Are you predisposed to be fat, fit, fast or ill – what your DNA says about you.